The following eaves arrangements represent common construction methods in the United Kingdom. 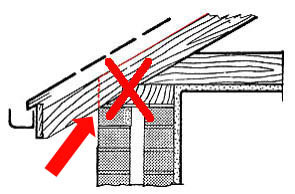 A common rafter-end assembly does not usually allow interconnecting airflows between roof space and atmosphere. An arrangement primarily arrived at to better insulate buildings and to prevent wildlife infestation, etc. 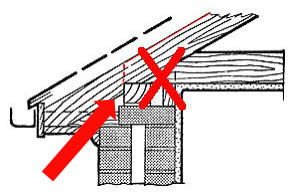 The eaves of most traditionally built roofs are blocked up at the wall-plate, either by bricks and mortar, torching or the wall-plates themselves. 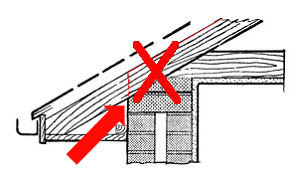 Even if the original eaves layout has been demolished to open things up, eaves to eaves ventilation is not in itself enough as warm air rises in a stacking effect. Therefore, provision must also be made for critical upper roof ventilation.